← THE LITTLE LENDING CO. ON COCO WEDDING VENUES. Signage is really coming into its own. So many stylish ways to show guests to their seats or more importantly, the nearest watering hole. It’s something you kind of need too if you have a spaced out venue or somethings tucked round the back that people will need to find. And personally, I think road side signage is a must to make sure everyone find you in the first place – it builds up lots excitement on the drive up too! You don’t need to make Signage expensive – Finding old wood or fence panels from Dads DIY projects, or logs and bark collected from the woods, slate or even large pieces of cardboard done right can get the job done using tins of forgotten paint at the back of the garage. Using what you have to hand makes the day just that little bit more easy and home-spun. Chalkboards are ‘the’ must have signage of the moment. A timeless cool of old school memories and nostalgia of days spent in classrooms with blackboards that roll and chalky fingers. And if you go wrong when writing the table plan in chalk there won’t be any tears – you can just rub it out! 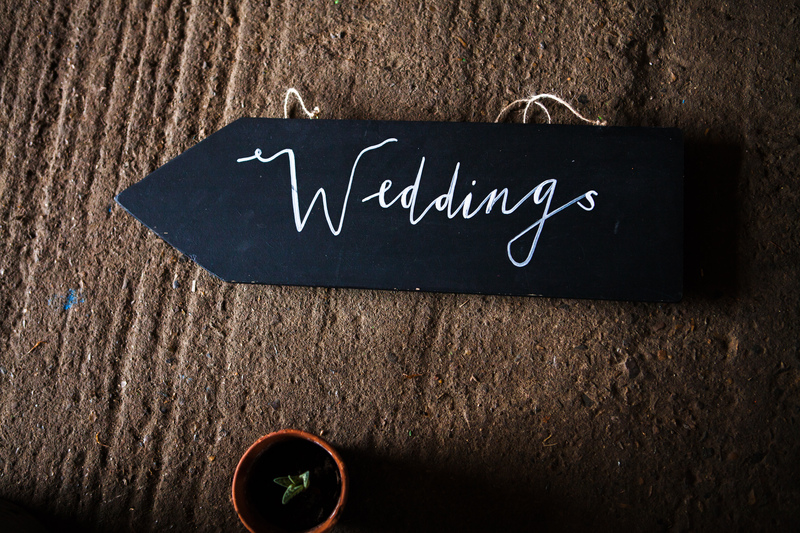 We’ve been adding lots of chalkboard additions; slate tiles, our home-made arrows (photographed), blackboard clipboards, making menus come to life, and our free standing large blackboards with or without easel are perfect for the days timetable or seating plan. Plus something new (after lots of compliments on my handwriting) we can now write on our chalk signs your messages and words for a small fee. Drop us a message if you’d like to know more about this service. For a lot more ideas on getting your wedding signed right, take a look at our pinterest board.